The proper celebration for an empty net goal is usually just a sigh of relief. It means a player did everything he was supposed to do, and now his team can relax and enjoy the inevitable win. 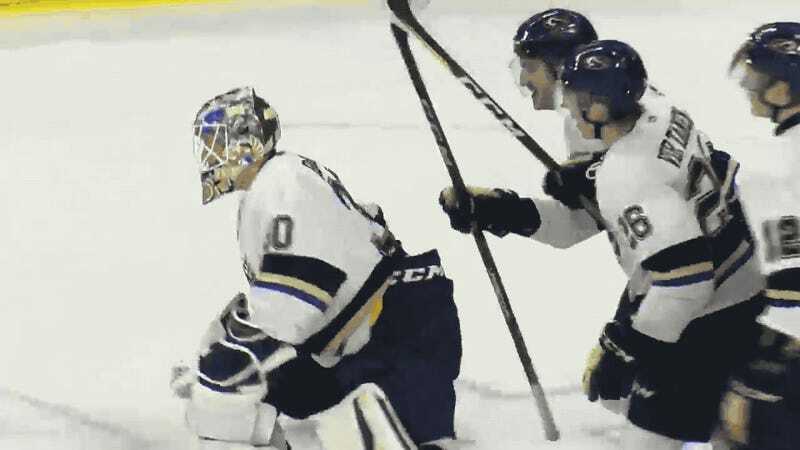 But sometimes, an empty netter is more than just the cherry on top—like when you’re Sioux Falls Stampede goalie Mikhail Berdin, and you play a position that, in NHL history, has only scored seven times on a direct shot. Berdin, a 19-year-old Winnipeg Jets draft pick playing in the USHL, sent the puck all the way down the ice from behind his own goal with his team up 6-4. Nobody on the Muskegon Lumberjacks was able to stop it, and as a result, Berdin got to pull out every celebration in the book. It’s hard to act like you’ve been there before when “there” only comes around once in a lifetime.